The Special EU Programmes Body (SEUPB) has awarded Grant Aid of €995,000 under Priority 2, Theme 1: Public Sector Collaboration to the Urban & Village Renewal Project to be delivered over 40 months, starting on 1st September 2010 and completing on 31st December 2013. The Project Promoter is the North West Region Cross Border Group (the “NWRCBG”). The Lead Implementing Council is Donegal County Council. The Partner Council is Strabane District Council. This project specifically aims to regenerate the towns of Lifford & Strabane. 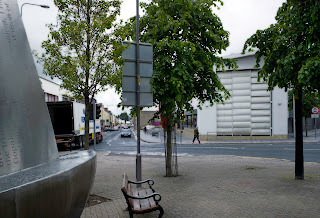 The project will assist the emergence of a vibrant, economically active and prosperous area through the provision and enhancement of two car parks, landscaping, footpaths and civic spaces in Lifford and by providing footpaths, public art, lighting features, murals and an outdoor gallery along the Railway Street in Strabane. Working in collaboration to the deliver the project, the two partners will ensure that shared best practice and learning are incorporated into the project design, implementation and delivery. If places are to be used and cherished they must be safe, comfortable, varied and attractive. They need to be distinctive and offer variety, choice and fun, It is therefore essential that any new development in Strabane is of the highest architectural and design standard which builds on the towns strengths. There is an important interdependency between buildings and the lives of people. Good quality, well designed buildings and spaces enhance and enrich their occupants, activities and lives and promote their well-being and health; they make a positive contribution to the urban fabric; they sustain and protect the environment and provide an opportunity for sound investment. A sparkling new community library and resource centre in Strabane was developed in 2003 and has become a catalyst for regeneration. 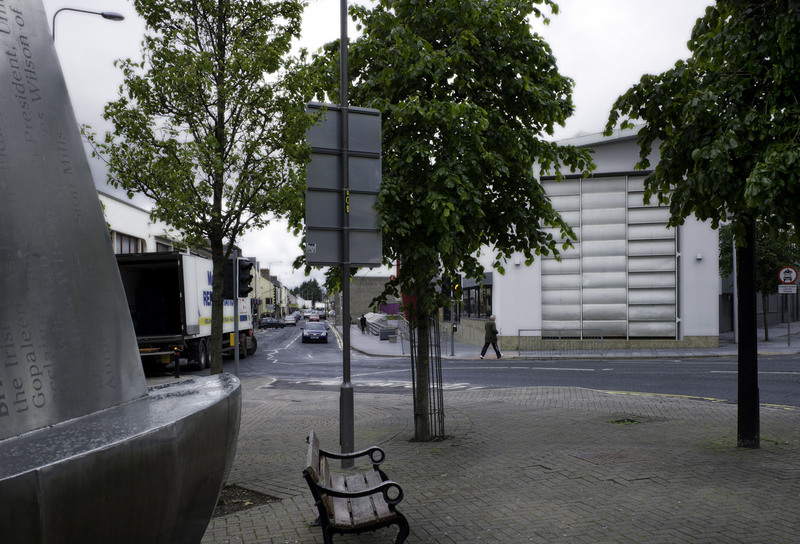 Designed by Spence McClean Architects, the site for the building was provided by Strabane District Council in a prime location right in the heart of Abercorn Square. The building sits on an island at the corner of Canal Street and Railway Street and is positioned to reinforce the feeling of townscape at Abercorn Square. It offers an outstanding position for the building, the foundation stone for which was laid by the Duke of Abercorn KG. In a link with the past the stone was retrieved from the old Water Wall in Strabane. The Water Wall stood on the bank of the river Mourne and was built in the 19th century as a flood protection measure for the town. The block of sandstone used was salvaged when a new concrete wall was constructed following massive floods in 1987. Strabane’s Library and Resource Centre was the first flagship project within the Strabane 2000 Regeneration initiative and has brought together a unique partnership between the Western Education and Library Board, Strabane District Council, Strabane District Development Trust and Strabane 2000. The £1.5 million building was funded by the Department of Culture, Arts and Leisure and Strabane District Partnership. The new building provided a much needed resource for Strabane and the surrounding district and brings the latest information technology to the community creating a new environment in which the arts and community education can be developed. This project is one phase of a wider development strategy. The building owes most of its form to addressing the triangular site on which it is built – and the surrounding streets. The general form of the building creates new street lines that follow the pattern established in the surrounding areas. At various design stages the architects held discussions with the future occupants to understand how the building was to be used. Such meetings led to the library space containing traditional book stacks and open IT facilities planned over two floors – a decision which became a factor in the siting of the ancillary accommodation. The building is roughly split in two with the library spaces occupying one wing and the cellular community spaces the other. Circulation spaces make up the third side. These are wrapped around a covered courtyard which contains artworks and provide a much needed multi-use space. This courtyard is a very exciting, vibrant area and has become a central focal point. Facing Abercorn Square is a large double height window which provides views inwards of the activities on the two floors of the library accommodation behind. It highlights the public openness of the centre and creates a real ‘civic’ presence. The entrance is situated to address future development sites around the building. The building is constructed on piled foundations, with reinforced concrete ground beams and floor slabs. The structural frame is reinforced concrete with flat concrete first floor slab. Circular concrete columns are exposed in the library areas. The roof is pitched structural steel. The mechanical and electrical services installations were designed to meet the needs of the Library and the Council. All equipment was selected to be as energy efficient as possible and incorporates features such as computer control of the heating and high efficiency luminaries. The building is fully networked to provide data communication throughout. External finishes include polished granite plinth, white painted render, dark blue clay facing brick, and aluminium framed double glazed windows and curtain glazing. The roof is aluminium standing seam, mill finish with glazed lantern light to internal courtyard and zinc cladding to feature windows and canopies. The commissioners would like to commission a large Public Art Work that is bold, innovative, timeless, and elegant and fits with the architecture that surrounds it. A permanent, large work, which will be robust, safe and relatively maintenance free. The commissioners are taking down the architectural louvre blinds normally referred to as breeze soleil that currently cover the library windows. The artist must address the previous function of these breeze soleil, which was to control heat build up as a result of solar gain. The artist’s submission must also address how to treat the lower portion of the window, essentially to give some physical protection to the low level glazing. The technical staff of Donegal County Council are available to support the artist/architect in addressing this. The artwork may be completely on the building or the artwork may also come from the building onto the adjacement pavement. The dimensions of the window and pavement are contained in maps. End of the Library Building and/or on the pavement at the end of the Library Building, Railway Street, Strabane, Co. Tyrone. Maximum budget of €86,000 (to include all artist’s fee’s, vat, materials, transport to site, crane hire, ground works, structural engineering costs, installation. Commissioners will cover costs of removing the architectural louvre windows, painting building after installation (this budget is ear marked to be spent by March 2012), making good footpath after installation. Please also note, the appointed artist will be required to submit a tax clearance certificate ( TC2) to Donegal County Council in advance of any commission payments being made. Donegal County Council and Strabane District Council Public are holding a two-stage open competition for proposals to this commission. - at least 10 hard copy images of commissions completed by the artist. Following adjudication by a Selection Committee - which will include representatives of Donegal County Council Public Art Office, an Artists’ representative, a representative from North West Regional Cross Border group, Technical expertise from Donegal County Council, a representative from Strabane District Council and the Library Strabane, four artists will be shortlisted to Stage Two. Artist must arrange their own site visits. Completed submissions – marked Urban and Village Renewal Project, Public Art Commission, County Secretary Office, Donegal County Council, Lifford, Co. Donegal should be lodged by 4.00pm on Friday 5th August 2011. Following selection, 4 artists will be invited to make a Stage 2 Submission which will be adjudicated under the following criteria – Aesthetic and meeting the brief, artists experience and previous work, use of materials and suitability, Health and Safety, Value for Money. Stage Two artists will be given a premia of €1000 to develop a detailed design, which will include budget and schedule for fabrication and installation.